Planned 120 West 72nd St. development. Used with permission of Rick Berstein, www.threedt.com. Residential building will require the demolition of a 1937, one-story building. Landmarks approved an application by the owner of 120 West 72nd Street to demolish the existing one-story commercial building and construct a 16-story residential building within the Upper West Side/Central Park West Historic District in Manhattan. The existing building sits between two 14-story buildings on West 72nd Street between Amsterdam and Columbus Avenues, a block predominately comprised of large masonry apartment buildings and residential row houses. The proposed building will feature a limestone base, weathered yellow and red brick cladding with limestone details, and a two-story penthouse. In approving the proposal, Landmarks determined that the existing one-story commercial building, built in 1937, was not deemed significant to the formation and approval of the historic district. 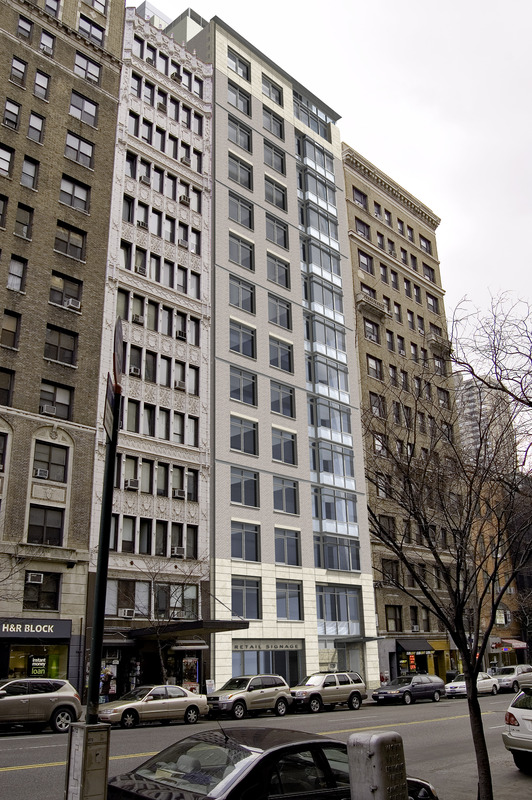 The Commission noted that the existing one-story building created a gap within West 72nd Street’s 14- to 16-story buildings and found that the new building would unify the streetscape. Landmarks also noted that the proposed brick and limestone materials would match the look of the brownstones and early 20th century apartment buildings found in the district.